In the early 80’s RICHARD BRAN SON was probably best known for Virgin Records. Virgin Records is the legendary record label that signed major names like the Rolling Stones, Janet Jackson and The human League. In 1984,Richard announced to the world that a high quality, value for money airline would begin operating within three months. During the three months, some of them licences, staff and an aircraft packed with celebrities later. Virgin Atlantic Airways was made. At the end of the decade they had flown over 1 million passengers and started shaking up services on-board by being the first airline to offer individual TVs' to their business and passengers. In 1992 Richard sold virgin music to Thom EMI and invested. The proceeds into virgin Atlantic, improving on an already great service. In the same year they launched the first super economy service hat went on to become their award winning Premium Economy. They spent most of the nineties buying new planes, expanding their route network and generally breaking new ground in passenger services, both on the ground and in the air. In 1999 Richard sold a 4990 stake in the company to Singapore airline valuing as at a minimum of £1.225bn. 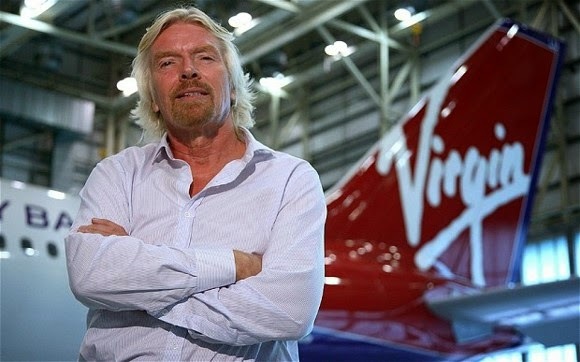 In the same year, for services to entrepreneurship Richard received a knighthood. In 2003 the launch of virgin’s Atlantic's revolutionary upper class suite, the longest and most comfortable flat bed and seat in business class. At Heathrow, a new virgin clubhouse opened n march 2006. Among st the many unique features of the flagship lounge are a cocktail bar, a hair salon, a cowshed spa, a brasserie and games room. At the Heathrow terminal three, a new check in facility of the Virgin Atlantic's brand came in 2007. economy and premium economy passengers zone A is now wider, brighter and more spacious, enabling passengers to check in at kiosks in a faster and more stress-free way. For upper class passengers came upper class wing which offers a private security corridor so passengers can speed through the terminal to the club house quicker than ever before. In 2008 we operated in a pioneering bio fuel demonstration with Boeing and engine manufacture GE Aviation on a 747 between London and Amsterdam. This has the world’s first flight using bio fuel by a commercial airline. Virgin Airline has also ordered 15 of the 787-9 Dream liners which burn around 27% less fuel per passenger than the A340-300, the aircraft it will replace in the virgin Atlantic fleet. In June 2009, virgin Atlantic celebrated it’s 25th Anniversary with a series of special fares, campaigns and event in the run up to its birthday as well as promoting red hot fares to red hot destinations. Virgin Atlantic is now based at London’s Heathrow, Gatwick and Manchester airports, it operates long hail services from Heathrow to New York (New York and JFK), Los Angeles, San Francisco, Washington, Boston and other countries. Virgin Atlantic has 38 aircraft in it fleet and they also have three air craft which are; Boeing 747-40ws, Airbus A340-600 and Airbus A340-300s and also they announced last year march that that they was ordering 15 of the 787-9 Dream liner's with options on ordering another eight 787-9s and purchase right on a further 20 aircraft. Virgin Atlantic employs around 9000 worldwide and also employs 4000 cabin crew around the world and 700 pilots round the world also. Virgin Atlantic carry’s between 5-6 million passengers each year. They have been winning awards since 1986 and they are honored to receive them.